Larbert forms a settlement 2.5 miles to the north west of Falkirk Town Centre. Falkirk is a large town in the Central Lowlands of Scotland, historically within the county of Stirlingshire. It lies in the Forth Valley, 23 miles north-west of Edinburgh and 20 miles north-east of Glasgow. The subjects are located on the eastern side of Muirhall Road between its junctions between Lorne Road and King Street. 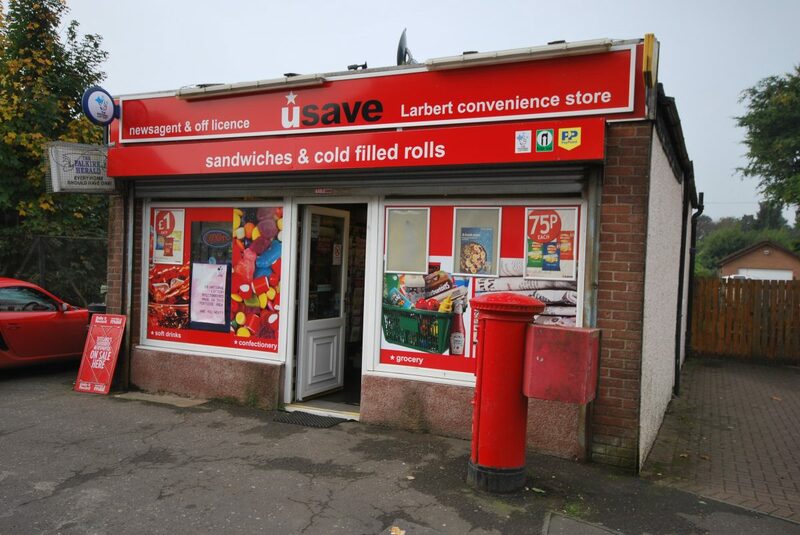 The shop is currently trading as an off licensed convenience store selling newspapers, magazines, confectionary, cigarettes, alcohol, paypoint, groceries and lottery. The shop has recently been refurbished and benefits from a modern fit out to include suspended ceiling, welded non slip vinyl floor, air conditioning and cctv system. Various shelving and slat wall has been installed. Internally, the subjects provide main sales area, rear store, kitchen and w.c. The kitchen area could be used to prepare food for sale to customers. We have not been provided with formal accounting information but our client has advised us that the shop is turning over between £5,000-£6,000 per week. There is scope to increase turnover and profit by preparing hot and cold food. Offers over £89,950 are invited for the Heritable (freehold) interest to include all fixtures and fittings and goodwill. Stock will be negotiated separately at time of sale. The current rateable value is £4,100. Qualifying businesses will be able to benefit from 100% rates exemption subject to application.